Small dogs usually live longer than larger dogs, but their increased lifespan doesn't necessarily guarantee good health. In fact, these five conditions and diseases are more likely to occur in smaller dogs. Breathing problems can be an issue in small dogs with short noses and muzzles, such as Shih Tzus, Pekingese, or Lhasa Apsos. Dogs that have brachycephalic airway syndrome may have difficulty drawing enough air into their lungs through their nostrils and may resort to breathing through their mouths. Dogs that have brachycephalic airway syndrome might breathe heavily while sleeping or exercising or may have difficulty breathing during hot and humid weather. Serious breathing problems or airway swelling may occur if your dog is anesthetized or sedated, despite the precautions your pet's veterinarian will take to minimize complications. Although using anesthesia can be risky if your dog has brachycephalic airway syndrome, surgery may be the best option to correct structural problems and improve breathing. Patellar Luxation. Patellar luxation occurs when your dog's kneecap becomes dislocated. The problem happens when the kneecap slips out of a groove that holds it in place in the thigh bone. A dislocated kneecap can cause pain, swelling, and lameness. It may even make it impossible for your dog to bend his or her leg. Miniature and teacup breeds are more likely to inherit the genetic defect that causes the problem. Surgery may be needed if your dog has patellar luxation. Cranial Cruciate Ligament Rupture. 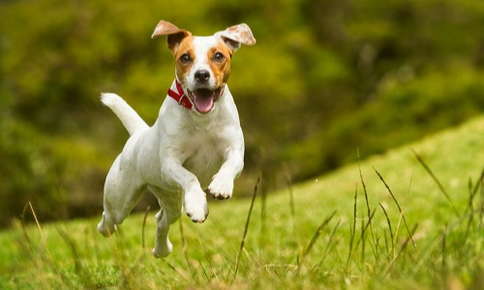 Some small dogs may be more likely to experience a cranial cruciate ligament rupture. The injury occurs when the ligament that stabilizes the knee joint and absorbs shock tears. You may hear a popping sound when your dog walks and notice limping or stiffness if the ligament has torn. Swelling and muscle wasting in the affected limb can also occur. Depending on the severity of the rupture, your dog may recover with a little rest, however, he or she might need surgery to repair the ligament. Legg-Calve-Perthes Disease. Toy poodles, miniature pinschers, and terriers are at increased risk of developing Legg-Calve-Perthes disease. The disease occurs when the blood supply to the femur (thigh bone) is interrupted, causing degeneration in the head of the bone. Symptoms include lameness, limping, stiffness or decreased range of motion in the joint as well as difficulty jumping or running. The disease often strikes puppies and is particularly common in young dogs between 4 to 12 months of age. Hip replacement or surgery to remove the end of the femur may be recommended. Everything about small breeds is smaller, including their pelvises. As a result, female dogs can encounter issues during labor and delivery and may require Cesaerean sections to safely deliver puppies. Some small breeds are more sensitive to allergens in the air and in foods. Even a small amount of an allergen can trigger rashes and itching when your pet isn't very big. Flea bite symptoms also tend to be more severe in small and miniature breeds, particularly if your pet is bitten multiple times. Regular use of flea protection and medication, changes in food, and allergy medication prescribed by your pet's vet may be helpful if your small breed develops skin irritations due to allergies. Pancreatitis, a serious inflammation of the pancreas, can cause vomiting, diarrhea, abdominal pain, and loss of appetite in any dog but is more common in small and miniature breeds. Intravenous fluids and pain medication can help your pet recover from a bout of pancreatitis. Your pet's veterinarian may also recommend a low-fat diet to prevent a recurrence of the illness. Regular check-ups are particularly important if you have a small dog, as some symptoms of illnesses, injuries, and conditions can be subtle at first. Periodic appointments will help ensure that your pet receives prompt treatment if any health problems are detected. Contact us to schedule a visit for your furry friend. Animal Planet: Are Small Dogs More Prone to Joint Issues?